When teaching effective Jack Russell Terrier obedience, it's always good to remember the three P's -- Patience, Persistence, and Praise. With this in mind you'll find that these dogs are extremely smart and very quick to learn most any skill. Teaching good socialization skills, be it with humans or dogs, is important in developing the kind of dog maturity and Jack Russell Terrier obedience an owner can be proud of. While some Russells can be very adoring of human visitors, licking too much and leaving white hairs stuck in your guest's black mohair sweater, others can be suspicious and defensive of their territory, embarressing you with rude growling and even nipping at your guest's heels. This is not a good example of Jack Russell Terrier obedience. In either case it is important to get your Jack Russell used to meeting visitors right from the start. Don't give him time to develop these rude behaviors by being there to manage and maneuver his every approach. YOUR ideal approach is to have already trained your dog to obey the verbal command of "SIT", "STAY", or "HEAL", and to have managed his understanding to the degree that he knows you mean what you say...every time you say it! If you haven't accomplished this amount of respect and obedience, do this first. It is these commands that will teach the dog how to cease from all unwanted behavior and bring about your best Jack Russell Terrier obedience. Again it is the 'Dog Whisperer' advice that rings out over and over...that YOU are the leader of the pack. And the dog must trust that you will follow through with a LEADER's dominance. So from the start, when a guest is being affronted with obnoxious affection or suspicious threats, let your Russell hear the tone of your voice in a firm command, forcing his backside to the floor in a sitting position. You may need to do this several times to obtain the Jack Russell Terrier obedience your after. The use of a leash may be constructive as well, just until he understands what you're after. 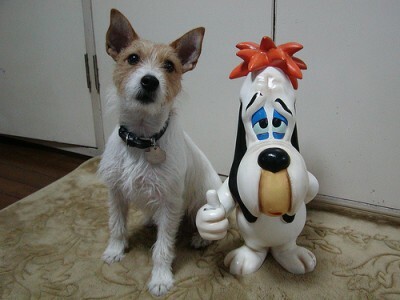 And with the three P's, he will understand and transform into a dog that you, as well as your visitors will marvel at. Always be consistent because while some visitors may love your dog's demonstration of affection, others may despise it. So when you allow your Russell to jump up on the lap of one and then scold him for doing it to another, this confuses the dog who doesn't have any idea which behavior he is to express. It is best to keep him at bay with all visitors, friendly but reserved. This is Jack Russell Terrier obedience at its best. One tip is to get your Jack used ot obeying commands for positive events. For example command your dog to "sit" before being fed or before going outside. Do not make exceptions. 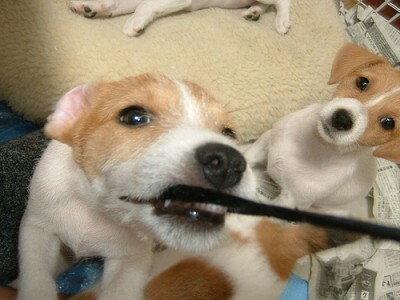 Another tip is to train your Jack Russell with a head halter when going for a walk. A halter applied gentle pressure around the nose, reminding the Jack to walk in line with you and to obey. We do not support training methods that involve punishment as Jack Russell Terriers are very smart and will hold a grudge. 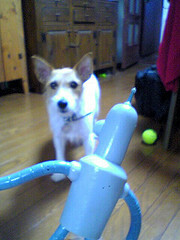 Better to be clear, firm and teach your Jack Russell that obedience is rewarding. Speaking of rewards, it's ok to reward your Jack occassionally and randomly with something that he or she finds special. 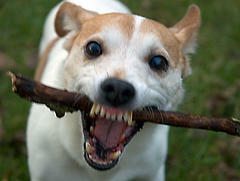 In some Jack Russells this can be play time and petting, in others it can be a special snack such as a liver snack. Of course if a relative or good friend has an on-going rapor with the dog and have their own rules and boundaries set up for that relationship, you needn't intervene. Now socialization with other animals is a whole different ballgame, and maybe one that can't be fully won. I'm really not sure because it is in this area of Jack Russell Terrier obedience training that my dog Jimbo and I run into problems. 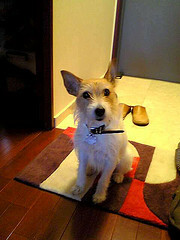 'Cause in this area... his wiley Jack Russell DNA is hard to master. 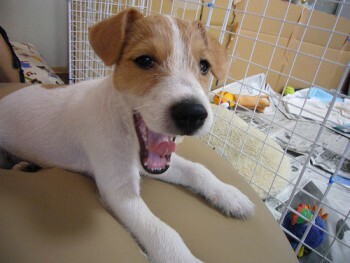 First off- Jack Russells think they are as big as Great Danes. This is the 'Napoleon Complex' referred to in earlier pages and translates to mean...Jack Russells are fearless against all odds, be it against actual Great Danes or, I dare say, even a Siberian tiger. They just have no concept of their small size, which can get them into some very dangerous situations. So, some good advice I might offer for this kind of Jack Russell Terrier obedience training is that if you live in a neighborhood where there are other dogs, introduce your Jack Russell to some of them, but with extreme and constant supervision. Be firm...and quick, ready to move in if need be. But do let the animals sniff and snort all they need to, until the pecking order is established. But be careful with some animals where no rapor can ever be established. Then it is best to simply avoid contact between them. 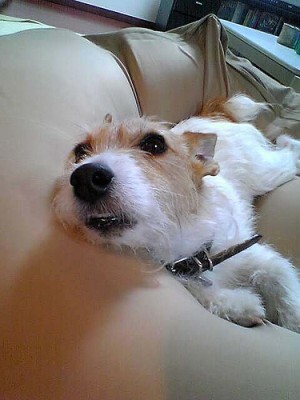 This kind of Jack Russell Terrier obedience can be fairly tricky. Basic social skills are a must in any dog breed. But it also has value for the the dog himself because it sets boundaries that make him feel protected and loved by the owner. This is Jack Russell Terrier obedience at its best. Just like a human child, a dog can get a little wild when allowed too much freedom. So love your Jack Russell with a little "tough love", and even it out with a little patience and hard earned praise... and you'll have as a reward a very good mannered, and well rounded dog for every kind of social encounter. ...Or at least most kinds.